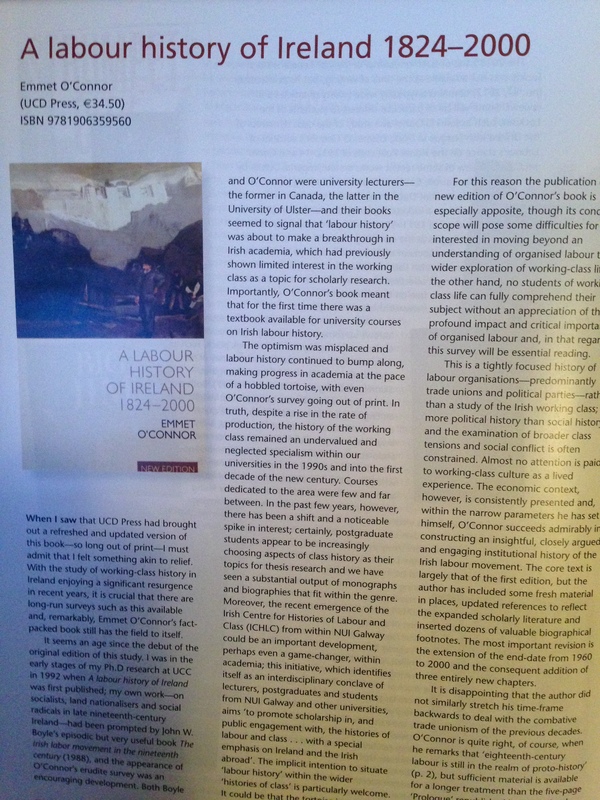 The following review of Emmet O’Connor’s A Labour History of Ireland, 1824-2000 (Dublin: UCD Press, 2011) appeared in the July/August 2013 issue of History Ireland magazine. When I saw that UCD Press had brought out a refreshed and updated version of this book – so long out of print – I must admit that I felt something akin to relief. With the study of working-class history in Ireland enjoying a significant resurgence in recent years, it is crucial that there are long-run surveys such as this available and, remarkably, Emmet O’Connor’s fact-packed book still has the field to itself. It seems an age since the debut of the original edition of this study. 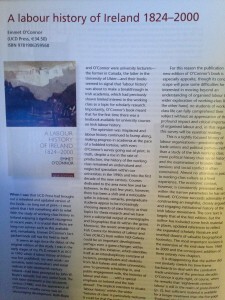 I was in the early stages of my PhD research at UCC in 1992 when A Labour History of Ireland was first published; my own work – on socialists, land nationalisers and social radicals in late nineteenth-century Ireland – had been prompted by John W. Boyle’s episodic but very useful book The Irish Labor Movement in the Nineteenth Century (1988) and the appearance of O’Connor’s erudite survey was an encouraging development. Both Boyle and O’Connor were university lecturers – the former in Canada, the latter in the University of Ulster – and, to my mind, their books seemed to signal that ‘labour history’ was about to make a breakthrough in Irish academia, which had previously shown limited interest in the working class as a topic for scholarly research. Importantly, O’Connor’s book meant that for the first time there was a textbook available for university courses on Irish labour history. The optimism was misplaced and labour history continued to bump along, making progress in academia at the pace of a hobbled tortoise, with even O’Connor’s survey going out of print. In truth, despite a rise in the rate of production, the history of the working class remained an undervalued and neglected specialism within our universities in the 1990s and into the first decade of the new century. Courses dedicated to the area were few and far between. In the past few years, however, there has been a shift and a noticeable spike in interest; certainly, postgraduate students appear to be increasingly choosing aspects of class history as their topics for thesis research and we have seen a substantial output of monographs and biographies that fit within the genre. Moreover, the recent emergence of the Irish Centre for Histories of Labour and Class (ICHLC) from within NUI Galway could be an important development, perhaps even a game-changer, within academia; this initiative, which identifies itself as an interdisciplinary conclave of lecturers, postgraduates and students from NUI Galway and other universities, aims ‘to promote scholarship in, and public engagement with, the histories of labour and class…with a special emphasis on Ireland and the Irish abroad.’ The implicit intention to situate ‘labour history’ within the wider ‘histories of class’ is particularly welcome. It could be that the tortoise is arriving. For this reason, the publication of a new edition of O’Connor’s book is especially apposite, though its conceptual scope will pose some difficulties for those interested in moving beyond an understanding of organised labour to a wider exploration of working-class life. On the other hand, no student of working-class life can fully comprehend their subject without an appreciation of the profound impact and critical importance of organised labour and, in that regard, this survey will be essential reading. This is a tightly focused history of labour organisations – predominantly trade unions and political parties – rather than a study of the Irish working class; it is more political history than social history and the examination of broader class tensions and social conflict is often constrained. Almost no attention is paid to working-class culture as a lived experience. However, the economic context is consistently presented and, within the narrow parameters he has set himself, O’Connor succeeds admirably in constructing an insightful, closely argued and engaging institutional history of the Irish labour movement. The core text is largely that of the first edition, but the author has included some fresh material in places, updated references to reflect the expanded scholarly literature and inserted dozens of valuable biographical footnotes. The most important revision is the extension of the end date from 1960 to 2000 and the consequent addition of three entirely new chapters. It is disappointing that the author did not similarly stretch his timeframe backwards to deal with the combative trade unionism of the previous decades. O’Connor is quite right, of course, when he remarks that ‘eighteenth-century labour is still in the realm of proto-history’ (p. 2), but sufficient material is available for a longer treatment than the five-page ‘Prologue’ republished here. The book deals well with the outbreaks of labour violence that occurred even after the decriminalisation of trade unions in 1824 and the author highlights the continued deployment of physical force by both sides, pointing out that one convict ship, the Essex, ‘transported seven men for combination offences between 1825 and 1834’ (p. 17). Nonetheless, an extended consideration of the earlier period would help readers to make more sense of this recurrent feature in labour/employer and labour/state relations. The eighteenth century was an extremely difficult time for trade unionists, who were forced to live an underground and often violent existence. The whippings in Cork took place between the North and South Gate bridges with the victims flagellated up and down the long main street. Among those publicly whipped were two journeymen coopers in June 1772, having been convicted of ‘refusing to work’, and John Dinane, a union member and linen weaver, who was whipped along the street on three consecutive occasions in August 1764. Such experiences were not unique and made trade unionists deeply suspicious of open organisation; indeed, localised clandestine unions continued to thrive – and engage in Whiteboy-style violence – until at least the late 1830s. The legal ambiguities regarding the functions of trade unions further complicated matters. Nevertheless, with regard to the period covered in this book, O’Connor provides a tremendous survey of the labour movement and its various associated political parties. Moreover, this is no mere delineation of events – it is a thoughtful, lively and, at times, provocative consideration that challenges the idea that the ‘priest, the peasant and the patriot’ (p. 289) can be held largely responsible for the historical weakness of political labour in Ireland. In fact, it is the third of these putative ‘demons’ that most concerns O’Connor and a key argument is that Irish labour would have benefitted greatly from an explicit and closer alliance with the nationalist movement. He blames ‘anglicisation’ and, more specifically, the penetration of British trade-union concepts for the failure to engage more productively with nationalism in the late nineteenth century. There are more counterfactual digressions than are usually found in academic history books as the author speculates on how political labour could have avoided its relative marginalisation in twentieth-century Ireland. These are summed up in his conclusion, where O’Connor identifies ‘four big blunders’ made in modern political life by the Irish labour movement (treated as a unitary whole) and it is worth noting that all relate to its interaction with the national question; they are (1) ‘the foundation error to spurn Davitt’s advice – John Redmond’s too – to build a labour-nationalist alliance with the IPP [Irish Parliamentary Party] in the 1890s’; (2) ‘the decision to withdraw from the 1918 general election rather than do a deal with Sinn Fein’; (3) deciding ‘to offer uncritical support to the 1921 settlement’; and (4) not ‘stealing a march on Fianna Fail…[but] instead helping its rivals into Leinster House’ (pp 291–2). Unfortunately, the ‘foundation error’ to which O’Connor points is not one that can be sustained by the evidence. In practice, such an alliance actually existed in the 1880s and 1890s – between the rural labour movement and the home rule party – and labour issues always took a poor second place to nationalist concerns. Indeed, there were occasions when home rulers deliberately undermined the rural labour movement, a prime example being the dissolution of the Irish Labour and Industrial Union (ILIU) into the newly founded National League in December 1882. The ILIU, which had over 120 branches, was formed to centralise the rural labourers’ groups that mobilised spontaneously during the course of the ‘land war’ of 1879–82; significantly, the motion to dissolve the organisation, an important initiative for labourers, was proposed by Michael Davitt. Likewise, in the 1890s the Irish Democratic Labour Federation was destroyed and the Irish Land and Labour Association considerably weakened by the internecine fighting in the home rule movement. Of course, it could be argued that the rural labourers’ connection to the IPP brought benefits in terms of social housing, but this much trumpeted achievement was slow in accruing and was often pointed to as a way of avoiding the trickier issues of wages and conditions. The home rule movement was never inclined to assist rural labourers in a class conflict with tenant farmers; on the contrary, it acted consciously to dampen such tensions. To disagree with O’Connor’s diagnosis of the ‘foundation error’ of political labour is not the same as suggesting that the urban labour movement in the 1890s took a sensible position on the national question. The lack of engagement proved debilitating. However – to indulge briefly in some counterfactual history of my own – it is arguable that, rather than building an alliance with the IPP, the labour movement would have benefitted had it engaged politically on the basis of a strong but independent national policy. James Connolly suggested as much but was a marginal voice in the 1890s: he also, incidentally, damned Davitt and Redmond as no friends of the Irish working class. This is a superb book that will continue to provoke debate and discussion, and remains essential reading for those interested in the history of the Irish labour movement. Fintan Lane is co-editor of Politics and the Irish Working Class, 1830–1945 (London, 2005) and Essays in Irish Labour History (Dublin, 2008).